A hillside course with moderate ups & downs and left and right doglegs . Each hole is different, so you will enjoy the variety. Natural hazards come into play on most holes, which can give you some pressure. However you’ll enjoy the natural surrounding. Most holes are downhill from elevated tees, which gives you a clear view of what lies ahead. Personally I think that the course should have been designed to play to around 6,800 yards rather than its current length of 7000 yards (par 72). This would have resulted in less artificial downhill holes and more decent natural uphill holes. A downhill short par 4 with a lot of trouble . The fairway is tight with water on the left and bushes on the right. Bunkers come into play off the tee. This hole has beautiful green whose front is protected by the water. The tee shot is not difficult because the undulating fairway is generous but tree branches hanging in front of the teeing area put you under a little pressure with the driver. The moderately sloped triple-tiered green is guarded by bunkers. The view of the green and its surrounding is wonderful. There is a 40 meter (130 ft.) drop from tee to green. Water borders the front of a narrow green with bunkers at the back, so an accurate tee shot is a must. The right club selection is very important on this intimidating hole. A 210 yard carry is needed to reach to the elevated fairway; otherwise, the shot often rolls down the slope on the left side of the fairway into bunkers. You need to pay attention to well-positioned bunkers and a lake on the right on the second shot. The green is shared with the18th Hole , so it is tremendously long. A beautiful as well as challenging dogleg to the left. The tee shot is over a lake, which is not too difficult. However, the second shot is very tough because the green is like a peninsula protruding to the right whose front and right face water and whose back are bushes, and moreover the green is narrow. A gentle downhill hole with an undulating fairway and green. Bunkers on the both sides of the fairway come into play off the tee. There is a lake on the right side of the green and a big bunker guarding the front o f the green. It takes one and half hours from Hong Kong by a club car. The car is better and more comfortable than a bus because you can shorten the time through immigration. I played with a single-handicap member from the black tees or tournament tees, which should be possible to play on weekdays. It seems that playing from the black tees is not allowed on Saturdays and Sundays. The black tees actually had no tees on the grounds, so we played from the sides of the yardage makers. Playing from the black tees, it is a very demanding and difficult course. When advanced players play from the blue tees of 6100 yards, 900 yards shorter, they are not only misled into thinking that the course is easy but also tend to become bored because the hazards in proper positions such as bunkers or lakes don’t come into play. There are yellow tees between black and blues tees, so the medium & advanced players understand the course better if they use at least the yellow tees. This club immediately became famous because the World Cup was held at the World Cup Course in 1995. 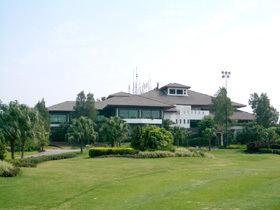 The Dynasty Cup, a Ryder Cup-style shootout between Asia and Japan, was also held at the World Cup Course in 2004. The adjacent hotel was very comfortable and its Chinese restaurant was very testy. One year ago, at the end of 2003, the old fairway turf was replaced, so the fairway condition was relatively good. Mission Hills GC is the world’s biggest golf complex with 10 courses or 180 holes as of 2004, overtaking the huge Pinehurst resort in North Carolina, which has eight 18-hole courses. The picture shows the 10 designers who are all world-famous players or a teaching pro. The 10 courses are designed by Jack Nicklaus, Vijay Singh, Nick Faldo, Jumbo Ozaki, Ernie Els, Annika Sorenstam, Rose & Poulter, Jose Maria Olazabal, David Leadbetter and Greg Norman. The two couses were added in 2007, Pete Dye Course and Zhang Lian Wei Couse (Par 3s course), so the club currently holds 12 curses or 207 holes. Jambo Ozaki designed the other courses: Templer Park CC in Malaysia, Tsu CC, Takahiko Three Country, J Classic GC, which are famous in Japan. Co-designers, Lee Schmidt & Brian Curley are the principal architects behind the 8 of the 10 courses. They designed the other courses in Asia, Muang Kaew GC (remodeled), Chiang Mai Highlands G＆SR, Amata Spring CC in Thailand, Grande Hamanako GC in Japan and Agile (雅居楽長江) G&CC - B Course in China. Their joint designs with Jack Nicklaus in Asia are Spring City (春城) G&LR - Mountain Course, Chung Shan Hot Spring (中山温泉) GC - Jack Nicklaus Course in China, Ishioka GC, Rokkou Kokusai GC (remodeled), The Tradition GC, President GC, Sanyo GC (remodeled), New Capital GG, Sun Belgravia GC, Bear Paws Japan GC in Japan, Sungai Long CC in Malaysia, and Springfield Royal CC in Thailand.